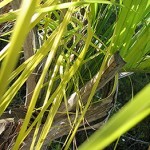 "Cocos Plumosa Trying To Die"
"Mulched & Fed Ground Beneath Palm"
I have a very small Queen Palm or Cocos Plumosa in some of the whitest soil on my property. 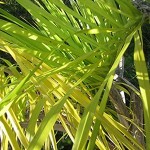 That poor palm has been yellow for as long as I can remember. Over the course of many years I have done very little for it. I am sure that at least once I have put a shovel full of Palm Fertilizer on it. It was better for a short time, but it always returns to yellow. This Palm matters very little to me. I have many more healthy specimens coming up all over my property. I see this poor little thing as a blessing though. It provides me with a chance to do an experiment. 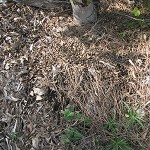 I have pulled the weeds from it’s drip line, and I have mulched it with tree leaves, bunny manure, and used coffee grounds. 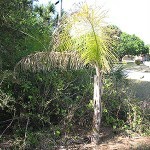 The pictures show what has happened to my yellow Cocos Plumosa in a month since I mulched and fed the soil beneath it. New growth is coming out green. I will make another post on the progress of this experiment after another month or two no matter what happens. This is a simple experiment. I can put anything but synthetic fertilizer on it, and I will report everything that I apply, and post new pics. Amazing at how effective the correct gardening techniques are. It is a modern miracle like modern medicine. Thanks for your comment Danny. This miracle is old as dirt, but let us continue to watch this experiment unfold and draw our conclusions then!